As we’re getting closer and closer to Halloween (my favorite holiday), I’m playing more and more with candies and chocolates of all kinds this year! While I’ve made a few candies in the past, it’s usually something that I try and steer clear of. Why? Well, candy making scares my pants off! 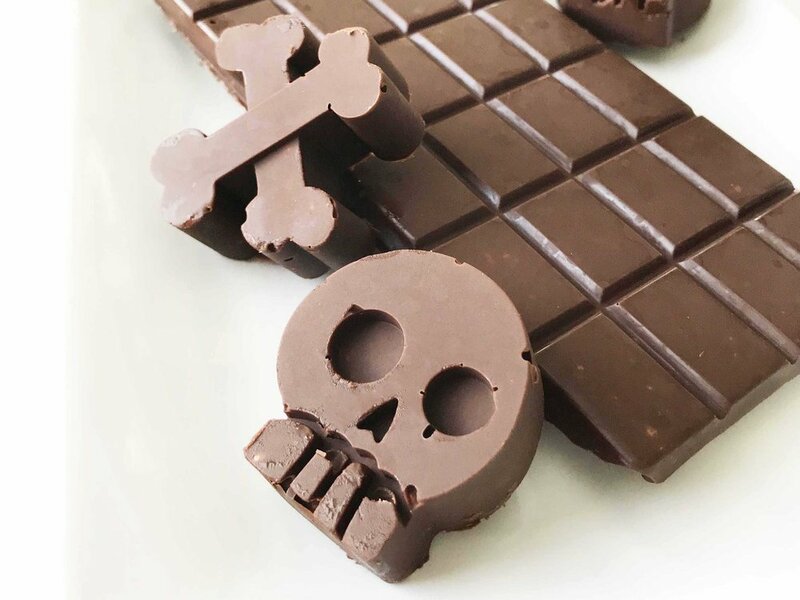 The notion of making candies just sounds overwhelming to me, but in all honesty, these dark chocolate crunch ‘bars’ are sooo easy to make and only require three ingredients to make! That’s right. Only three ingredients and about ten minutes of your time. It doesn’t get much more simple than that when it comes to homemade chocolates, does it? So to start these chocolates out, you need chocolate. Pretty standard stuff here. I went with some allergen-friendly dark chocolate morsels. They were a little more pricy than some of the other brands, but I know it’s good quality chocolate that isn’t junked up with a bunch of stuff that they don’t need. But, that being said, you could probably get away with using any chocolate chip here. Just know that the better the quality, the better the taste when it comes to chocolate! For the ‘butter’ aspect I chose to go with coconut butter, but you may also use peanut butter, almond butter, … really any other sort of nut butter that you could think of. I like the mild flavor that coconut butter adds to chocolate which is why it was my go-to here. For the ‘crispies’, you can use crispy rice cereal or puffed quinoa. I happened to have a giant box of crispy rice cereal on hand already, so that’s what I went with. But, if it hadn’t have been for that, I would have went and sought out some puffed quinoa! 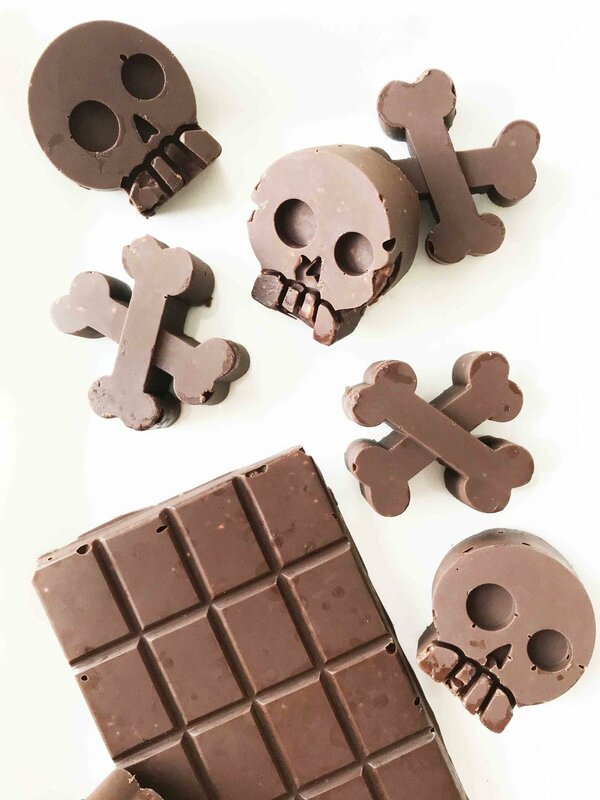 To make these chocolates, you will need some molds. I prefer silicone molds because of their ease of use and because I have a lot of option when it comes to shapes. And since Halloween is just around the corner, I went with some skulls and cross bones that I think I had leftover of my daughter’s ‘mermaid and pirate’ birthday several years back. I also took up the chance to reuse my chocolate bar molds which I had from her ‘unicorn’ birthday a couple of years back too! I like to keep the chocolate stored in the fridge for a nice quick cold guilt-free snack! 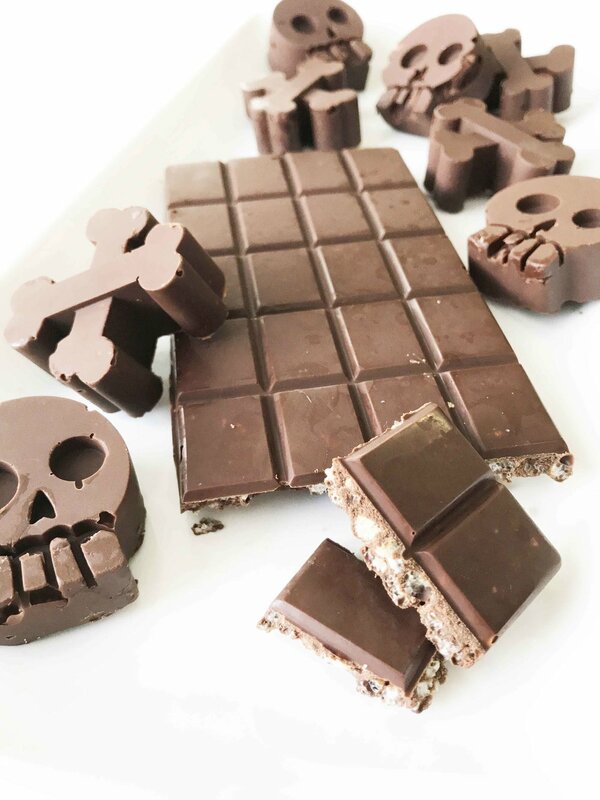 These homemade dark chocolate crunch bars are so easy to make and delicious too! Make them your own by using special shapes of silicone molds. Perfect for holidays and gift-giving! Place the 200g dark chocolate chips and 2 Tbsp. coconut butter into a medium pot together. 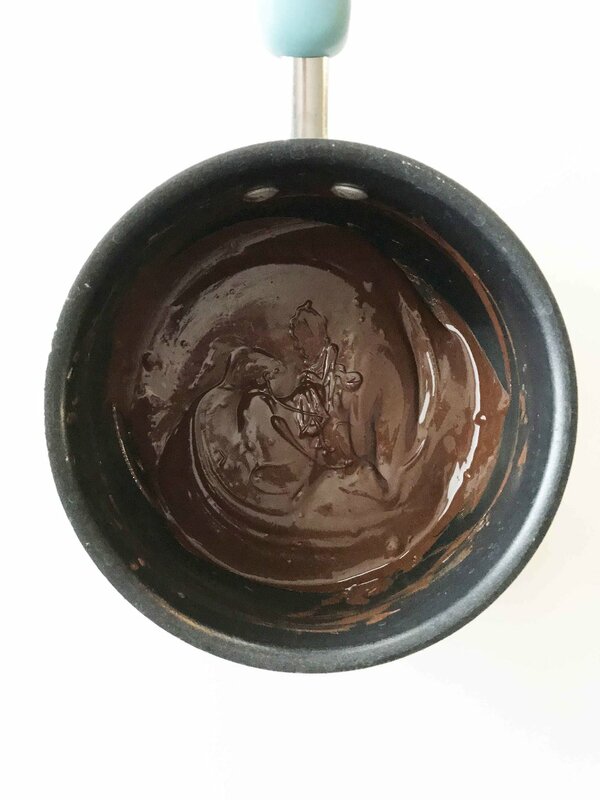 Heat over a double boiler (or over a smaller pot with boiling water) to melt the chocolate and coconut butter together until smooth and creamy. Remove from the heat and stir in the 1 C. rice cereal. Transfer the mixture into any silicone mold. 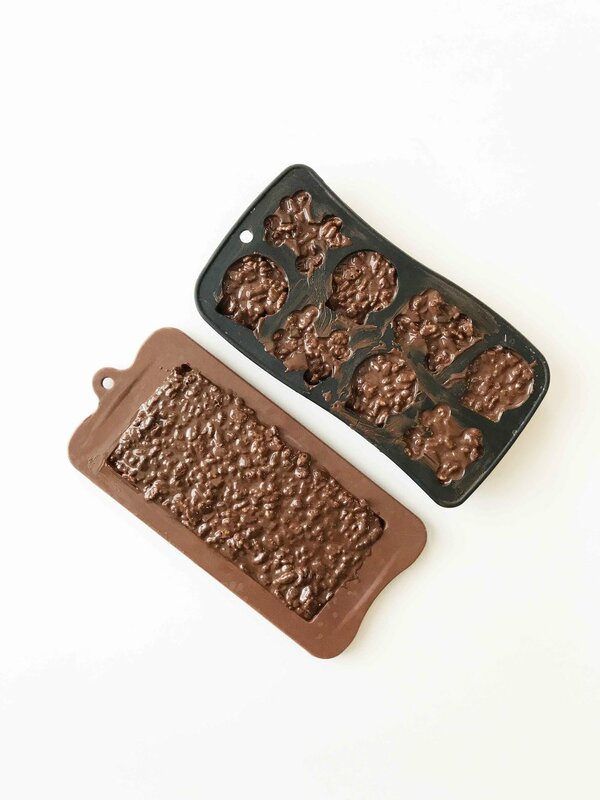 Place the molds into the fridge to chill and set for one hour. 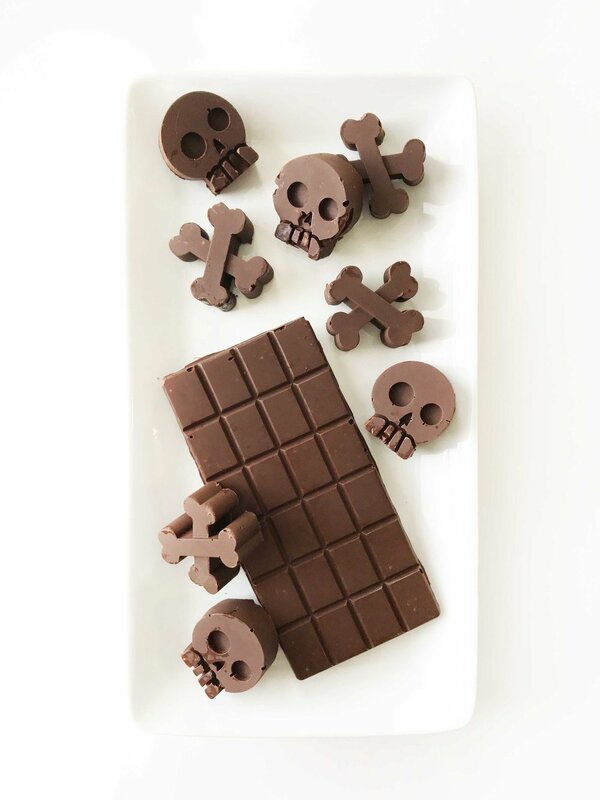 Once the chocolate is set, remove from the molds and enjoy!